Our/New York on Chelsea’s West 26th street is the first distillery in Manhattan since prohibition that not only cultivates great vodka, but unique spirits both in and out their homemade glass bottles. At our recent infusions class & distillery tour, New York natives & tourists alike made their own bottles (and more than enough cocktails) of Our/Vodka—available in six other cities including Berlin, London, and Los Angeles— infused with fruits, herbs, botanicals, and exotic vegetables. But it’s the tasting tours led by bar manager, Rustun Nichols, and serial entrepreneur & street artist, Dave Ortiz, that tell the whole story of Our/New York, which distills Manhattan’s culture and high-quality grains with true hard-knocks passion into every ounce of Our/Vodka produced. Started in 2010, Our/Vodka relies on a global network of city natives who only incorporate the best of local ingredients. History is at the very heart of every Our/Vodka location, including New York, which imparts the city’s heritage inherently into each bar design to match the vodka’s small-batch feel. Worth a visit alone, the Our/New York distillery & bar was designed primarily by David Ortiz, known famously on the New York skate culture scene as the founder of the skateboard company, Zoo York. That same authenticity and self-made attitude is evident in the distillery & bar’s complete design. The pristine tasting room in back, where the vodka is blended and bottled, is visible from the cast-iron bar adorned with Our/Vodka artwork Ortiz drew himself. The entire bar’s color scheme plays homage to Ortiz’s love for street graffiti and uses reclaimed wood sourced from Brooklyn. 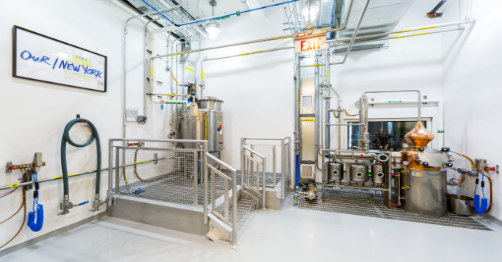 Our/New York even upholds a carbon-conscious footprint by donating glass and recyclable materials to local art schools, making it both the safest distillery in Manhattan AND the most environmentally minded. Our/Vodka makes vodka most noted for its floral and fruity qualities. Rustun Nichols, serving as bar manager & bartender on tasting tours, made a variety of vodka cocktails, including the “dirtiest” of martinis using New York City tap water. Each of the brand’s six distilleries, from Berlin to Los Angeles, uses the region’s neutral alcohol — highly concentrated ethanol — plus each city’s own tap water. While the water is demineralized and purified, Our/Vodka aims to impart the flavor of where the vodka’s made for a signature taste & cultural callback to each distillery’s roots. Ortiz, a lifelong New Yorker, attributes Our/Vodka’s distinctive flavor to the local water: “New York’s water also makes the best bagels and pizza dough in the world.” Sourcing the finest quality corn from Indiana, the spirit derived for Our/New York’s vodka is fermented with a proprietary yeast in a small-batch alembic copper still system. Vodka is one of the most difficult spirits to make. Given how complicated it is to produce a good vodka in large batches, it is even harder to produce great vodka in a micro-distillery. Yet Our/New York is a crowning achievement in the big apple, instilling a cocktail culture with old school ingredients. 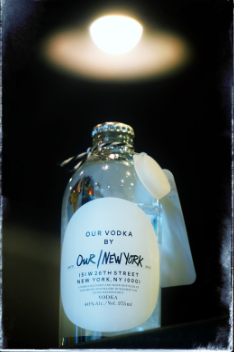 The Our/Vodka bottles even wear a small crown cap as a seal of simplicity and honor - because it’s currently the Vodka King of New York.